One of the greatest films ever made, Once Upon A Time In The West is film-making as breathtaking art, a strong contender for the best Western of all time, and an unforgettable viewing experience. 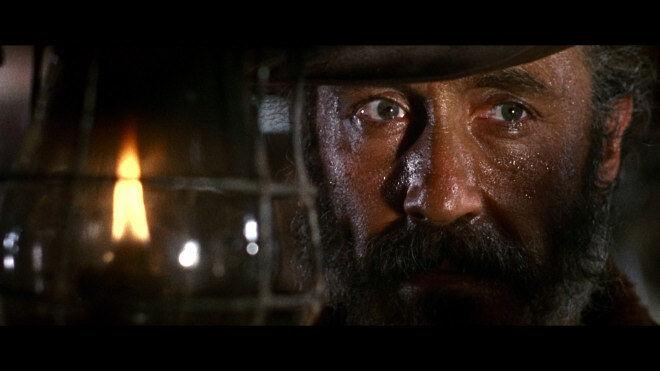 Sergio Leone's crowning achievement is both an homage and a perfect example of the genre, combining traditional elements with a sweeping tale of an era's end enhanced by five unforgettable characters, while the music, cinematography and editing set standards rarely matched in the history of cinema. It's the age of westward rail expansion. 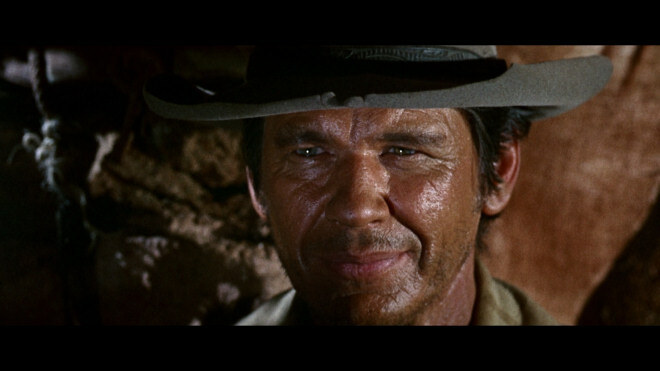 At a small train station on the way to the town of Flagstone, the mysterious Harmonica (Charles Bronson) disposes of three men sent to kill him. Meanwhile, Frank (Henry Fonda) leads a group of men and they viciously kill Brett McBain (Frank Wolff) and his children, at McBain's isolated Sweetwater farm. Frank, who is doing the land-clearing dirty work of crippled rail tycoon Morton (Gabriele Ferzetti), tries to pin the McBain family murder on local outlaw Cheyenne (Jason Robards). Snaky: It looks like we're... it looks like we're shy one horse! 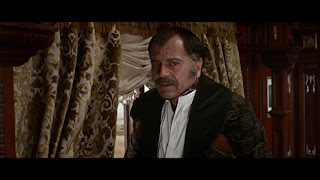 To Frank's surprise, McBain had recently married Jill (Claudia Cardinale), a New Orleans prostitute, and she arrives at Sweetwater just in time to complicate Morton's attempt to seize the land. Both Harmonica and Cheyenne support Jill in holding her ground and not fleeing her isolated new home: Harmonica needs to draw Frank into a showdown for his personal reasons, and Cheyenne does not appreciate being falsely blamed for the murder of children. With Jill's intransigence causing friction between Morton and Frank, Harmonica and Cheyenne need to guard against each other while plotting to protect Jill; end Frank's reign of terror; and fulfil Brett McBain's unlikely dream. After The Good, The Bad, And The Ugly, Leone thought that he was done with Westerns. But offered a large budget and the opportunity to work with Fonda, he created a timeless epic.With an intricate story involving five compelling characters finding their destiny in shifting times, a wondrous Ennio Morricone music score, and dazzling camerwork by cinematographer Tonino Delli Colli, Once Upon A Time In The West is a superlative achievement. The main theme of Once Upon a Time In The West is the creeping modernity represented by the rail line transforming the West from rule by the gun to influence by the dollar. Men like Harmonica, Frank and Cheyenne have little to offer the coming new world. While Harmonica and Cheyenne know their place, Frank is caught between two worlds, seduced by Morton's business methods but unable to give up his old ways of getting things done through abject violence. The drama swirls around Jill, who represents the bridge between the old and the new, giving up the rough life of a whore for the noble role of frontier woman. 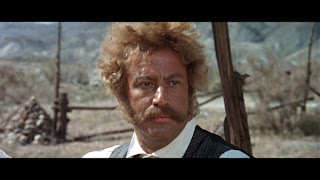 Leone wrote the script with Sergio Donati, from a story that Dario Argento and Bernardo Bertolucci helped to conceive, and collectively they used the traditions of the Hollywood western as a fountain of unlimited ideas. Classics like High Noon, Shane, 3:10 To Yuma, The Searchers, The Comancheros and Johnny Guitar provide inspiration, but Once Upon A Time In The West establishes its own majestic identity and soars to a higher standard, thanks to an unmatched emphasis on artistic style where the slow, tension-filled build-up to every event is as important as the event itself. The casting of Henry Fonda against type as the ruthless villain Frank is simply a stroke of genius. 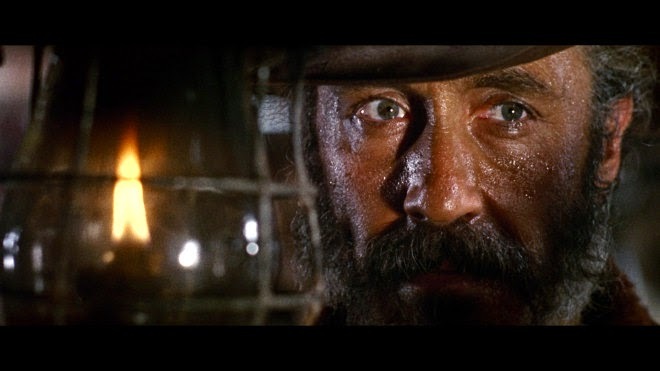 Fonda delivers a chilling performance, literally a child killer, his ice-cold blue eyes emanating an utter lack of emotion as he makes his way West, gathering property and riches on behalf of Morton. Bronson was born to portray Harmonica, a man who influences events but says very little, his eyes and sorrowful tune carrying the burden of a haunted past, and a burning desire to impart revenge for an injustice that will remain a mystery until the final 10 minutes. 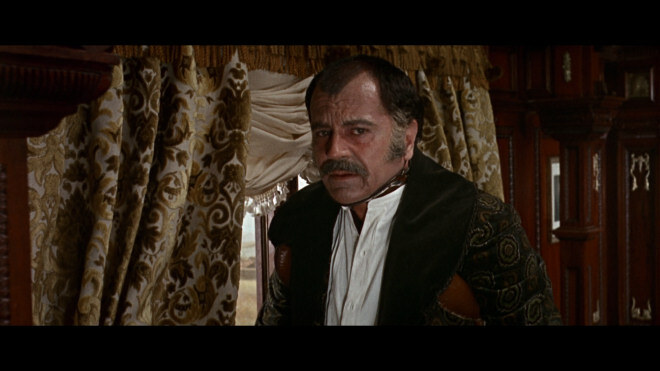 Jason Robards gets the showiest role as the bandit Cheyenne. Stopping just short of being the noble savage, Robards plays Cheyenne as the outlaw resigned to a jagged life of recurring capture and escape, observing the territory that he operates in getting smaller as men like Morton expands the reach of the law. Cheyenne is nothing if not a survivor, able to meet, understand and control every challenge, including identifying true allies like Harmonica although they may look like the most dangerous of enemies. 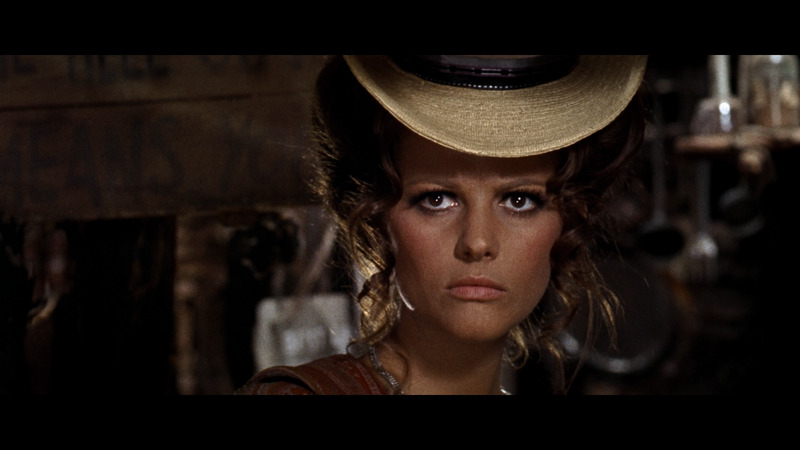 Claudia Cardinale is surprisingly excellent as Jill, representing civilization's shift west in search of a better future. Sensual and not hiding neither her past nor her vulnerability, Cardinale proves to be a match for the three men who immediately descend on her in Sweetwater. Effectively sparring with Cheyenne, doing enough to live through her encounter with Frank, and trusting her instincts as Harmonica helps to uncover her destiny, Jill uses all her survival tricks to withstand a most unexpected introduction to life at the western end of the rail line. Jill: If you want to, you can lay me over the table and amuse yourself. And even call in your men. Well. No woman ever died from that. When you're finished, all I'll need will be a tub of boiling water, and I'll be exactly what I was before - with just another filthy memory. Gabriele Ferzetti rounds out the quintet of characters with intertwined destinies, Morton a man who started his journey on the Atlantic coast and will not rest until he lays eyes on the Pacific, despite the debilitating effects of tuberculosis in his bones. Morton's physical frailty only serves to heighten the increased importance of commerce over violence to resolve disputes. Whether he himself succeeds or not, the future belongs to men like Morton. Morton: How does it feel sitting behind that desk, Frank? Frank: Almost like holding a gun... only much more powerful. Morricone creates an orchestral musical theme for each of Harmonica, Frank, Jill and Cheyenne, music that is distinctive for each character yet beautifully interlinked into a rich soundtrack that adds immeasurably to the powerful elegance of the movie. The music enhances an endless sequence of breathtaking images and exquisitely constructed scenes, Leone and Delli Colli conspiring to capture outstanding landscapes, unexpected angles, tight close-ups and heightened drama with the most patient pacing. Frank: Morton once told me I could never be like him. Now I understand why. Wouldn't have bothered him, knowing you were around somewhere alive. Harmonica: So, you found out you're not a businessman after all. Harmonica: An ancient race. Other Mortons will be along, and they'll kill it off. Frank: The future don't matter to us. Nothing matters now - not the land, not the money, not the woman. I came here to see you. 'Cause I know that now, you'll tell me what you're after. Harmonica: ...Only at the point of dyin'. The opening credit sequence, with three of Frank's men waiting for Harmonica to arrive, is a study in astoundingly imaginative filmmaking. Woody Strode, Jack Elam, and Al Mulock as the three gruff killers sent by Frank to eliminate Harmonica, help to turn those ten minutes into screen gold. But Leone also finds magic in a simple shot of a camera rising above the Flagstone train station to reveal the sprawling town that has taken a root as a result of rail expansion, Leone capturing in one frame the essence of the movie. And leaving the best until near the end, the final epic showdown, including the mythologically-captured flashback to the source of Harmonica's internal rage, complete with a surreal archway in the middle of nowhere, is a candidate for the most outstanding scene ever placed on film. Jill: Will you come back someday? 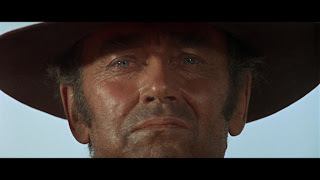 Once Upon A Time In The West is a masterpiece, an artistic achievement that transcends any one genre and stands among the all-time most eloquent examples of cinematic success.